Greetings, friends and TGIF! As you know I’ve been purging my household in preparation for our goal of downsizing… and boy have my eyes been opened! I have spent a fair amount of time shaking my head over the accumulation of “stuff” throughout my home and thinking through how to bring order into our abode. Well I have a treat for you today in the way of sharing a new book that has been a timely resource for me these past several weeks! 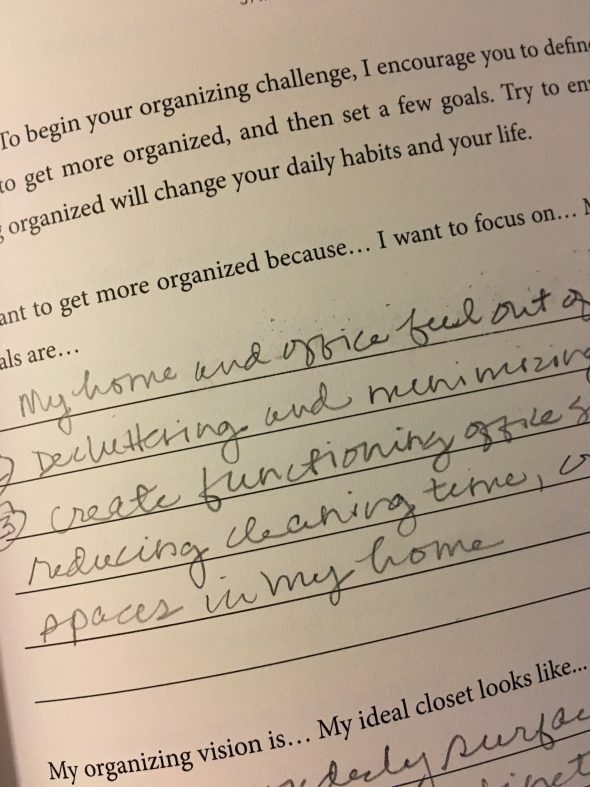 Organizing For Your Lifestyle by Jane Stoller came my way at the end of last year and has proved so helpful in motivating and focusing my purging and reorganizing efforts. Over the years I have read PLENTY of articles on how to get organized. In fact I have a Pinterest board devoted to just that topic. But Stoller’s book takes a different thoughtful approach to organizing that resonates with me. Organizing For Your Lifestyle is a quick read (I read it cover to cover in one evening!) chock full of insights and inspiration to tackle your organizational challenges. The first part of her book guides you through some goal-setting for your organization effort and a short quiz to help you determine where you fall on the “disorganized to organized” scale. I actually felt a bit better about myself after taking that quiz! But then Stoller dives into the psychology — the science — of why getting organized is a game-changer. This chapter is the most important of her book. After all, if you can’t understand the benefit, why bother?? What I had not realized is that my lapses in organization at home were causing some degree of stress. And of feeling overwhelmed. And that awful feeling of where do I even begin? She deftly articulated in a few pages exactly what’s been hanging over my head for months. The rest of the book is divided into chapters that each address an area of your home — your closet(s), your kitchen, your bathroom, even your books and storage areas. She also devotes a chapter to travel — such a great tool as we head into spring break season! Every chapter outlines common struggles, but Jane offers solutions that can be tailored to YOUR lifestyle. Rather than giving cookie cutter organizing tips and systems, she encourages you to really think about how you live, what your day to day looks like, and what your priorities are. I’ve personally spent countless hours/days/months trying to adhere to systems of organization that just have not worked… for me. Yes, she suggests certain tools and resources to help you get organized, but her overriding message is that all the baskets, bins, and velvet hangers in the world won’t work if the system you’re trying to implement runs counter to how you live your life. True Confession: My biggest challenge in my home (beyond the normal closet and cabinets that catch-all) is my office. What started out as a place to blog, write, pay bills, etc, has become a catch-all of its own. I have baskets of craft supplies I thought I wanted handy for those DIY-crafting times that are now so rare. I have shelves full of things I thought I would want to save — back issues of magazines, books I haven’t referred to in years, baskets of letters from former students and parents, and paperwork to be filed. I have drawers of extra school supplies that I no longer need (hello, you’re empty-nesting now! ), and file boxes and binders of Legacy documents. There is so much in there, I can no longer work in there because I can’t think straight. So I end up on my laptop on the sofa or at the kitchen table. After reading Organizing For Your Lifestyle, here’s what I’ve realized: the way I need that office space to function has changed and I have not re-evaluated my system or the contents of that room since. I need it to be a part-time office for Legacy (I often work at home after school hours) and to resume its role as a space to write and pay bills and in general manage the household. It cannot be a storage room for years gone by and still function as my lifestyle now dictates. Now that I’ve clarified how I need to use the space, I have a strategy — anything not related to Legacy, blogging/writing, or the management of our household needs to go altogether or find another home. Craft supplies, there’s a cabinet in the basement with your name on it. Old magazines, you’re headed for the recycle bin. School supplies? Donation central for you. Get the idea? It is so freeing to have a different perspective on organizing! I didn’t realize how much I needed a fresh approach to an age-old problem. Does any of this resonate with you, too? 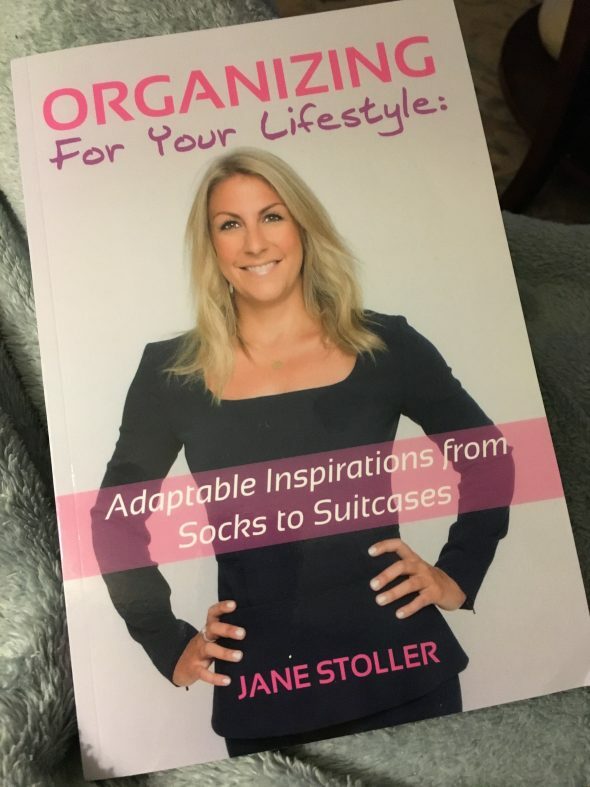 If so, today is your lucky day because Jane and her team have offered one Decor & More reader a Kindle version of Organizing For Your Lifestyle! Here’s how to enter… simply leave a comment telling me what your biggest organizational challenge is OR an organization goal you have for your home or office. This giveaway will close on Wednesday, March 8th at 10pm EST. The winner will be chosen using Random.org and will be posted here an notified by email. I’m so excited to be able to share this with all of you… this book will be my companion in our next home as well, so I can hopefully avoid the disorganized (and stressful!) state I’m crawling out from under now! Looking forward to reading your comments, friends… have a wonderful weekend! *Disclosure: I was provided a copy of Organizing For Your Lifestyle for my honest review. All opinions are my own. Affliliate links were used in this post. additional insulation) and go through every single item to decide whether or not I truly love it or need it. Good luck with your purging! So need this. We may be relocating to Oregon/Idaho and everywhere I look there is clutter and stuff we don’t need. Been overwhelmed with all of the recent life events and work/school. Ordering the book today. Mine is my home office. Too cluttered. I think my wife should read more great posts like this!!! Thanks for sharing.